Literacy Initiative – Are you up for the challenge? 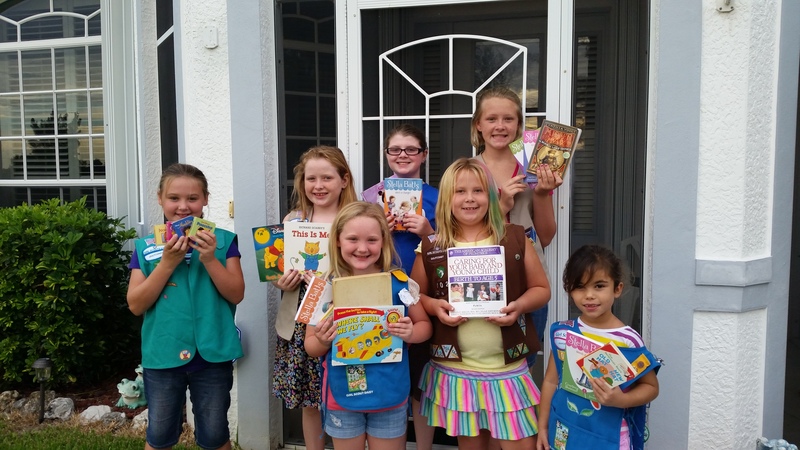 « Girl Scouts of Gulfcoast Florida, Inc.
Literacy Initiative – Are you up for the challenge? At Girl Scouts of Gulfcoast Florida, we KNOW we can make a great impact on problems we see in our communities. Our entire nation, state, and within the 10 counties we serve, adults, children and girls are at risk of falling behind. With over 9,000 girl and adult members, Girl Scouts of Gulfcoast Florida is focused on a mission this year to curtail this literacy risk. Girl Scout, Sydney Ring of Venice is in the process of her Gold Award Project, “Books and Bears for literacy.” Sydney’s project focuses on encouraging preschool aged children to engage in the love of books and early reading. She set her goal to collect 500 new books for local children and she further expanded the program to include 500 new bears so each child could also have a “reading buddy”. Sydney hopes to spread her passion and excitement for the “Books and Bears for Literacy” outreach into other counties so more children can develop a love for reading. Currently, a “Books and Bears Literacy II” is being planned for Charlotte County by a young man who wants to continue building an awareness for early literacy needs. Troops 8, 748, and 462 of LaBelle will be working together on an ongoing project called Little Free Library. Little Free Library is a free-standing birdhouse-style box with a door full of free books. They have several opportunities to put these libraries up in LaBelle, FL. Lee 13 collected over 500 books for Golisano Children’s hospital for their monthly community service project. Service Units in Lee County are hosting a community table and literacy programs at the Southwest Florida Reading Festival. Manatee 4 is collecting new or gently used books in lieu of admission for their fall event to donate to a local literacy council. As mighty Girl Scouts of Gulfcoast Florida, our projects, awards, community service, and awareness are certainly the beginning of working together to create change. Girl Scouts of Gulfcoast Florida are Taking Action to Change the World. Are you up for the challenge?